To continue with our rainbow theme, I made this DIY Alphabet matching activity. First, I drew a rainbow using these pastels. Then I laminated the rainbow painting since the pastels do transfer to hands. I wrote with this Sharpie upper and lower case alphabet on these dot sticker sheets. I then arranged twenty-six of these self-adhesive magnets on the rainbow to represent the upper case letters, securing them to the rainbow by removing the backs. To make sure that the upper and lower case magnets attack, stick the upper case dot sticker to the "face" of the magnet already secured to the rainbow. With lower case letter magnets you will NOT be removing the backs, but rather placing a lower case letter sticker ON the back, which is white and will remain on the magnet. This will ensure that lower and upper case magnets will attack. 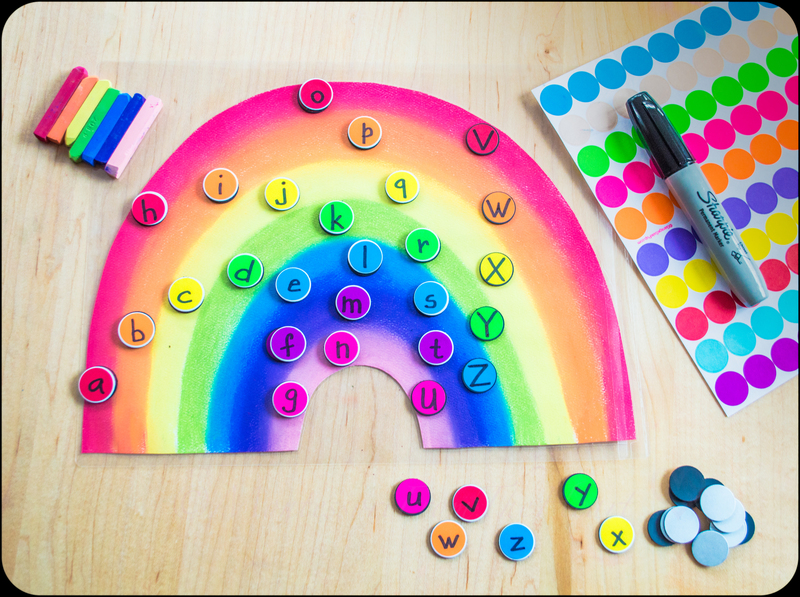 Offer your child to match the loose lower case magnets to the upper case magnets already adhered to the rainbow. This language matching activity is also a great fine motor and hand-eye coordination exercise. In the process, the child also practices color recognition and rainbow color sequencing since the upper and lower case of the same letter will have matching colors. Once the child completes the activity, offer to "run" on the rainbow singing the ABC song. Magnets are great since this assures you will not have tiny dot letters all around the house!. For more on rainbows, see here our ☘️St Patrick's Day Kids Activities. See here 💛💙❤️Primary Colors, 💦Water & Paper Capillary Action ⌛️Timelapse ⚗️ Kids Science Experiment (🌈 Rainbow Walking Water). Also, see here 🖌Markers ☕Coffee Filters 🌈Rainbow Walking 💦Water ⌛️Timelapse Kids ⚗️Science Capillary Action.